We are a franchised Nissan dealer based in Aughnacloy, County Tyrone, Northern Ireland. 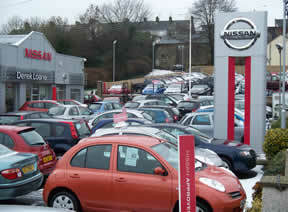 We are specialists in New & Used Nissan vehicles. We also stock a comprehensive range of quality used cars from non-Nissan marques. Having served his time as a mechanic in Watson and Hadden, Derek Loane decided in 1970 to set up a facility from his Aughnacloy home selling used vehicles and using his experience as a mechanic to offer serving and repairs. Today, the Nissan franchise stands as testament to the success of Derek's efforts. As a family business you can be are assured of a high level of personal attention when you visit either of our dealerships. We feel we are equipped to offer you the best possible service when you buy a vehicle from us.